Pour mémoire, voici un bref historique de la Black Library, extrait de l'article Wikipedia disponible en anglais sur la toile. The Black Library is a division of Games Workshop (formerly a part of BL Publishing) which is devoted to publishing novels and audiobooks (and has previously produced art books, background books, and graphic novels) set in the Warhammer Fantasy Battle and Warhammer 40,000 fictional universes. The publishing company took their name from Warhammer 40,000, where the Black Library stored knowledge of Eldar race, the sinister Chaos, and the haunting Necron. Some of Black Library's best known titles include the Gaunt's Ghosts and Eisenhorn series of novels by Dan Abnett and the Gotrek and Felix series by William King and Nathan Long. The authors of these novels, graphic novels, and comics created original storylines and characters that are based on playable armies in the main Warhammer 40,000 game and its many spin-offs (such as Inquisitor or Epic).These works are then promoted with contributions of stories, plot synopses, and rules in the White Dwarf magazine and at the official Games Workshop website. The result is a fusion of tabletop gaming with science fiction and fantasy writing. The Black Library was founded in April 1997 to publish INFERNO! magazine, a bi-monthly digest-sized anthology of short stories, comic strips and features from the Warhammer worlds. Black Library began as team at Games Workshop brought together to INFERNO! magazione. INFERNO! 's success spawned Warhammer Monthly comic books, and then from September 1999 a lengthy series of fantasy and science fiction novels. Their first art book, Inquis Exterminatus was published in May, 1999. 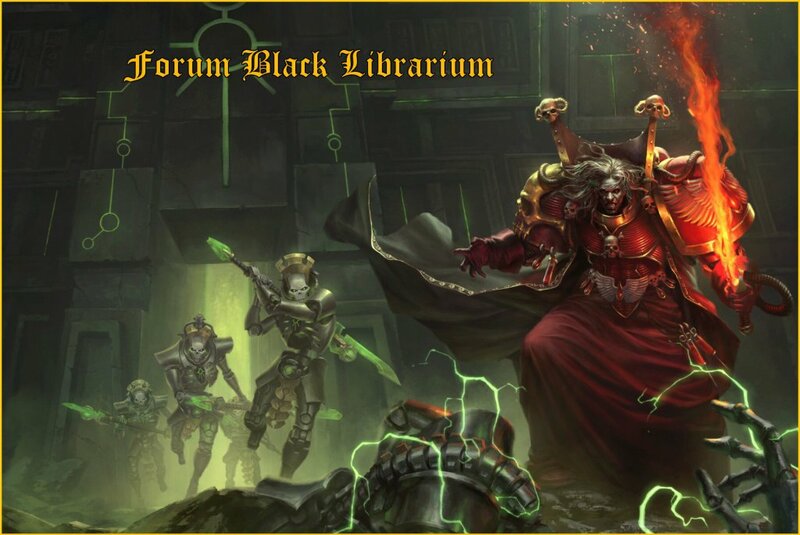 Black Library's catalogue now runs to well over two hundred titles, with a Warhammer and a Warhammer 40,000 novel appearing every month. The majority of these stories are written in the perspective of humans, primarily those of the Imperial Guard, the mechanics of the Adeptus Mechanicus, the female warriors of the Sisters of Battle, the holy Inquisition, and the superhuman Space Marines, although some have been written from the perspective of the Eldar, Chaos and Tau. They span the complete Warhammer 40,000 game with occasional expansions into the spin-off games, such as Necromunda or Inquisitor, or use vehicles and equipment only found in Epic or Battlefleet Gothic. Suite en suivant le lien cité ci-dessus en source !